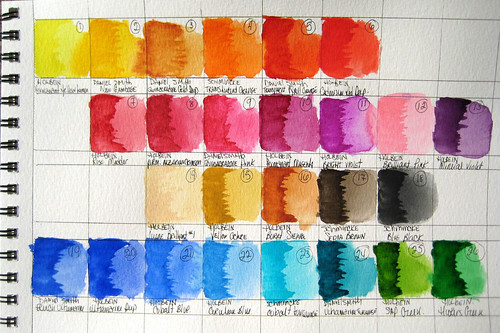 My Watercolor Palette, originally uploaded by biffybeans. I did the first wash with a #6 round brush, then once dry, went back over it with a #4 round to show a deeper shade. Did you get the new Daniel Smith catalogue this week? One truly beautiful new colour--Garnet. I did...but not sure what I did with it. I might have already ditched it. I want ALL of their paints and I try not to tempt myself. I feel like I have enough colors right now, and probably even maybe too many. It's time I started writing on my own blog.